In most of the SAS programmes we use Binaural Frequency Differentials (BFD), which aim to gently guide our naturally occurring brainwaves in a certain direction, either up or down, faster or slower. In order to understand the importance of brainwaves we need to know more about how we can measure them, what they are linked to, and how we can guide our brainwaves in a certain direction. 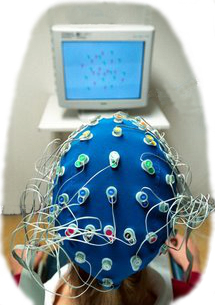 Standard EEG test[/caption]Electroencephalography (EEG) is the recording of electrical activity under the scalp. 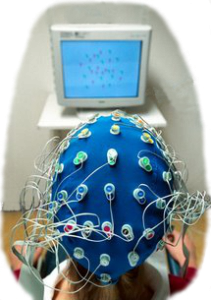 EEG measures voltage changes resulting from current flows within the neurons of the brain. In clinical contexts, EEG refers to the recording of the brain's spontaneous electrical activity over a short period of time, usually 20–40 minutes, as recorded from multiple electrodes placed on the scalp. A short history of EEG measurements: Richard Caton (1842–1926), a physician practising in Liverpool, presented his findings about electrical phenomena of the exposed cerebral hemispheres of rabbits and monkeys in the British Medical Journal in 1875. In 1890, Polish physiologist Adolf Beck published an investigation of spontaneous electrical activity of the brain of rabbits and dogs that included rhythmic oscillations altered by light. In 1912, Russian physiologist, Vladimir Vladimirovich Pravdich-Neminsky published the first animal EEG and the evoked potential of a dog. In 1914, Napoleon Cybulski and Jelenska-Macieszyna photographed EEG-recordings of experimentally induced seizures. German physiologist and psychiatrist Hans Berger (1873–1941) recorded the first human EEG in 1924. Expanding on work previously conducted on animals by Richard Caton and others, Berger also invented the electroencephalogram (giving the device its name), an invention described "as one of the most surprising, remarkable, and momentous developments in the history of clinical neurology". His discoveries were first confirmed by British scientists Edgar Douglas Adrian and B.H.C. Matthews in 1934 and developed by them. Delta is the frequency range up to 4 Hz. It tends to be the highest in amplitude and the slowest waves. It is seen normally in adults in slow wave sleep. It is also seen normally in babies. It may occur focally with subcortical lesions and in general distribution with diffuse lesions, metabolic encephalopathy hydrocephalus or deep midline lesions. It is usually most prominent frontally in adults (e.g. FIRDA - Frontal Intermittent Rhythmic Delta) and posteriorly in children (e.g. OIRDA - Occipital Intermittent Rhythmic Delta). Alpha is the frequency range from 8 Hz to 12 Hz. Hans Berger named the first rhythmic EEG activity he saw as the "alpha wave". This was the "posterior basic rhythm" (also called the "posterior dominant rhythm" or the "posterior alpha rhythm"), seen in the posterior regions of the head on both sides, higher in amplitude on the dominant side. It emerges with closing of the eyes and with relaxation, and attenuates with eye opening or mental exertion. The posterior basic rhythm is actually slower than 8 Hz in young children (therefore technically in the theta range). In addition to the posterior basic rhythm, there are other normal alpha rhythms such as the mu rhythm (alpha activity in the contralateral sensory and motor cortical areas that emerges when the hands and arms are idle; and the "third rhythm" (alpha activity in the temporal or frontal lobes). Alpha can be abnormal; for example, an EEG that has diffuse alpha occurring in coma and is not responsive to external stimuli is referred to as "alpha coma". Beta is the frequency range from 13 Hz to about 30 Hz. It is seen usually on both sides in symmetrical distribution and is most evident frontally. Beta activity is closely linked to motor behaviour and is generally attenuated during active movements. Low amplitude beta with multiple and varying frequencies is often associated with active, busy or anxious thinking and active concentration. Rhythmic beta with a dominant set of frequencies is associated with various pathologies and drug effects, especially benzodiazepines. It may be absent or reduced in areas of cortical damage. It is the dominant rhythm in patients who are alert or anxious or who have their eyes open. Gamma is the frequency range approximately 30–70 Hz. Gamma rhythms are thought to represent binding of different populations of neurons together into a network for the purpose of carrying out a certain cognitive or motor function. Mu ranges 8–13 Hz., and partly overlaps with other frequencies. It reflects the synchronous firing of motor neurons in rest state. Mu suppression is thought to reflect motor mirror neuron systems, because when an action is observed, the pattern extinguishes, possibly because of the normal neuronal system and the mirror neuron system "go out of sync", and interfere with each other. The SAS Binaural Frequency Differentials are based on "Binaural Beats" and this is the hum you can hear in the background of most of the SAS programmes. A short history of Binaural Beats: They were first discovered in 1839 by H. Dove, a German experimenter. Binaural beats are perceived by presenting two different tones at slightly different frequencies separately into each ear. The effect is produced in the brain and not in the ears. It is produced by the neural output from the ears and created within the olivary body within the brain, in its attempt to "locate" the direction of the sound based on phase. Example 1: start at a constant 10 Hertz, which after a few minutes gradually speeds up to 26 Hertz. Once this frequency is reached, it remains at this level till the end of the programme. This particular programme can be used to activate the client and can be given in the morning or afternoon, but should be avoided just before going to bed. It can help hyperactive clients to calm down.Example 2: start at a constant 20 Hertz, which after a few minutes gradually slows down to 6 Hertz. Once this frequency is reached, it remains at this level till the end of the programme. This particular programme can be used to deeply relax the client and should be given just before bedtime. It can help adult clients to feel more at ease and fall asleep.© 2013 – Steven Michaëlis. This article was read 7255 times.